Beer, bike racing and Trappist monks. Nothing weird about that. With Omloop Het Niuewsblad and Sunday’s Kuurne-Bruxelles-Kuurne just days away, we raise a glass of Trappist beer in toast and hail the stellar efforts of Dutch brewing. After all, you gotta wash those frites down with something. Budweiser would just be bad form, like showing up to race the cobbles on a Schwinn Varsity. When it comes to making beer with religious fervor, the Belgian Trappist monks are the masters. 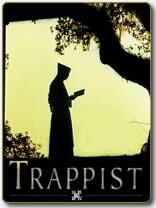 Trappist beers are considered by beer critics to be among the finest in the world. Here’s the six pack: Achel, Chimay, Orval, Rochefort, Westmalle, and Westvleteren. That last one was named best beer in the world a few years back and the monks are now forced to ration sales. But Boonen is always good for a extra case. 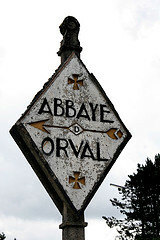 There is no one Trappist taste profile and each of the abbeys brew their own distinctive recipes. 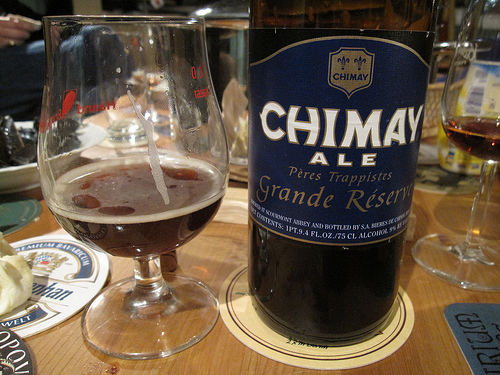 The classic Chimay has aromas of malt, apricots and black currants. While the famous, deep chocolate colored Westvleteren 8 brings to mind figs, plums and raisins. Reviews of the Rochefort Ten mention a port-like complexity of raisins, plums, hard candy and sherry. All Trappist beer is “bottle conditioned” which means, like wine, it’s only going to get better with age. Not like that six pack of Corona you had left over from last summer. For a wonderful little Belgian beer tasting blog, check out Mr. Cook. For a beer to qualify for Trappist certification, the brewery must be in or near a monastery, monks must play a role in production and all profits must support the monastery or outside social programs. Would sponsoring the Quick Step team quality? Of course it does. Manager Patrick Lefevere backs the team bus up to the monastery loading dock after every big race. The monks take the three vows of stability, fidelity to monastic life, and obedience. At least two of those vows guarantee you a fantastic beer because you know they’re paying attention to the brewing process. Those of us back in the states owe Belgium many thanks for inspiring the fabulous beer coming out of Fort Collins, Colorado. The New Belgium Brewery began as a wild idea after the founder took a bike trip across God’s gift to cobblestones. In fact, they even took back the Belgian power source — it’s the only wind-powered brewery in America. Okay, we’ve saluting all things Dutch to in preparation for the cobblestones. We’ve waxed musical about Golden Earring and the classic Radar Love song, we’ve examined the Belgian fascination with frites and plumbed the mysteries of the Dutch Bike craze. In other words, we’ve worked up quite a thirst. It being Friday, it’s time for a run to Beverages & More for a few sixers of the monk masterwork. « The Dutch Bike craze. The humble Belgian commuter bike becomes an “it” object.